It's day two - perfect accessories time and I'm in my element here of course! All over the internet and regularly in emails, I see women asking how to look more groomed, more stylish and I'm a firm believer in the power of accessorising. 1. If a scarf has black, navy, grey, white or cream somewhere in the colour way, you will wear it with many more outfits. I don't think there are many wardrobes that couldn't fit this one in and today on the school run (and a walk down by the Lagan) it's given new life to a camel jumper that I don't wear as often as I would like to. I'm also looking forward to wearing with my Perfect Jacket from yesterday. Jewellery wise, you can't beat a statement necklace for looking 'put-together' on the school run. It just immediately elevates an otherwise plain outfit. The high street (and my shop) are full of fabulous, inexpensive necklaces. If you're unsure of colours - go for a silver or gold. 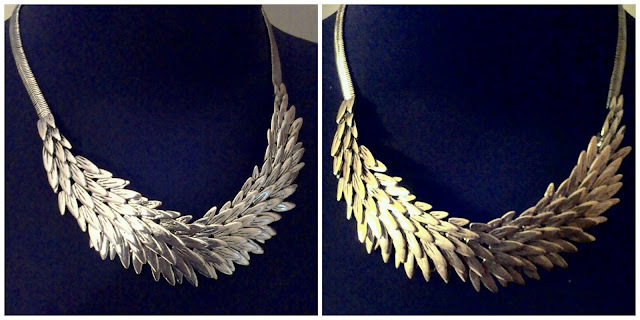 Here is my Perfect Necklace - Overlapping Leaves in silver (left) and gold (right). It's my best selling necklace and you can pick it up on the 'Not On The High Street' website for £24...or from me for £14! Neutral, close fitting to the neck but doesn't sit too high, it will transform the simplest of outfits.. Tomorrow - it's the turn of The Perfect Boot - see you then! Brilliant scarf and perfect for any and every outfit! Loving the school run outfits! Yes, you've nailed the perfect scarf! Great pattern and colours and would definitely fit in with any wardrobe. Love the necklace too. Gorgeous scarf Avril and I'm loving the necklace too! Love that scarf, this would be my perfect school run outfit, its those Ash/Marant style boots that have done it! Looking lovely Avril... I'm curious about the location - is this local? Lovely scarf and necklace. Great basic ideas that you often forget in a rush. 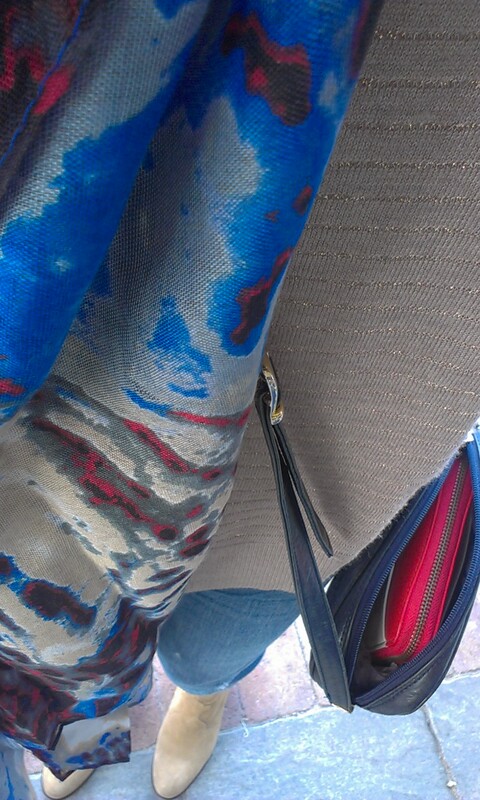 Gorgeous scarf - I miss wearing them in the heat of summer here! Loving these 'back to school' posts Avril - lessons for us all - no pun intended ;-) I must say I can wholeheartedly agree about the necklace, it's fab...I love mine and am not surprised it's a best-seller. I discovered your site a few weeks ago and it is inspired! I love it. After reading this particular entry I ordered the scarf and the silver necklace. They have just arrived (very quickly I might add) and I can't wait to wear them. Thank you.